Why Watch it Today? : Bela Lugosi was born on this date in 1882. By 1942 he was sixty and his career was beginning to consist of appearances in Poverty Row productions who valued him only for his increasingly limited marquee value. 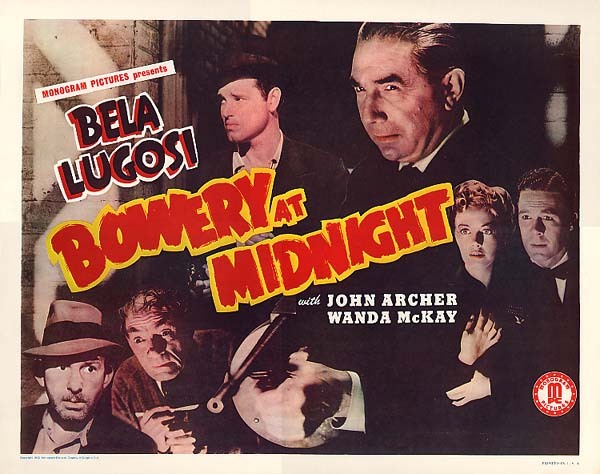 Bowery at Midnight stands out among these productions for its oddity-at it’s heart is a “Weird Crime” story that would be at home in EC Comics or on radio shows like Inner Sanctum, but complicated by Lugosi’s three identities, secret rooms within secret rooms and hinted at ghoulishness-makes it worth seeing. The short running time (62 minutes) means Bowery at Midnight doesn’t overstay its welcome. This entry was posted in Black and White, Crime, Horror, Mad Scientist, Movie of the Day, Thriller, Zombies and tagged anthropologist, bank robbers, bank robbery, Banner Productions, Bela Lugosi, college students, double cross, jewel thieves, lobotomies, low-budget, mad surgeon, Monogram Pictures, professors, scientists, secret lair, soup kitchen, teacher student relationship, Tom Neal. Well, at least you didn’t pick Bela Lugosi Meets A Brooklyn Gorilla, heh… TCM had Mark of the Vampire on yesterday and I finally caught all of it, as I hadn’t seen the whole movie before. Well, this is my third year doing this, so I already ran some of his better movies, but I really do enjoy how odd this one is. If you’re wondering why no Dracula, it’s because I weirdly don’t like it. Well, well… we’re in the same boat on that. I prefer the Spanish language version of Dracula (shot on the same sets on nights after the US version was done for the day), which is a must-see just for the better casting and sexier tone. Even though it’s 30 minutes longer, it’s a superior effort in every respect. I think Bela was a fantastic Dracula but the rest of the film was weak; conversely, the Spanish language Dracula is better on everything but the guy playing Dracula, IMHO. I just felt he didn’t have Lugosi’s weird presence or charisma. Yeah, I’d definitely agree. Too bad Bela didn’t speak any Spanish. I felt the original was too stagey (as it were adapted from that play but with bigger sets), and while Lugosi was a great Dracula, everyone else was struggling to keep up. At least in the Spanish version, every other person BUT the vampire is cheerfully chewing the scenery to good effect. A mash-up? Why the hell not. Could be interesting.